An Interview with Dava Sobel. · One Book. One Author. One Hour. An Interview with Dava Sobel. 1:34 Sobel is not sure how her book came to be on Booknotes, but she had wanted to be on the program since the book came out. It was the publication of an illustrated version that secured the interview. 2:08 She was often being interviewed and had been doing a great deal of work on the book, so she didn’t need to “prep” for her interview with Lamb as far as the information went. However, she did get a haircut. 3:01 Felt “caught” on a few odd questions which were about small details within the work. 3:19 From the experience on Booknotes she remembers most that her New York Times review appeared when she was out of town at a ballroom dance competition. As a dancer himself, Lamb latched on to that piece of information and asked several questions about it. 4:50 Feels that the hour-long interview allowed for banter and exploration, which was a great change of pace. It made the interview much more relaxing. 8:20 She things that authors and readers find learning about the process and craft of writing interesting, so it makes sense that Lamb asked about it. Lamb latched on to the fact that she worked early in the morning and that she writes notes to fans in a fountain pen. 9:45 She was surprised by getting personal questions on the program and she did not experience any biographical questions on other programs. 11:16 She was very surprised by the question of when her father had died. She was so surprised that it took her a moment to remember the year. 12:15 She does not watch television so she did not watch the program, except for a few in preparation for her appearance. 13:02 She thinks that the blank set was relaxing for the interviewee, making it feel intimate. 13:37 Thinks that the books from Booknotes serve as a time capsule, showing what the reading public was interested in. 14:04 Would have returned for another interview if asked, and did return to a similar CSPAN program where authors did a three hour round table. 15:47 She attempted to get in contact with her publisher to see if there was a bump in sales after Booknotes to get hard numbers, but feels that the show almost certainly did have a positive impact on sales. 18:04 Talks about her work since having appeared on Booknotes. 24:58 She feels that the lasting impact of Booknotes will be as a nostalgic “golden hour” because there isn’t a platform like it today. 26:01 She admires Brian Lamb for having an idea, seeing it through, supporting it, nurturing it, and allowing it to grow into something great which she is sure far exceeds his initial goals for the show. Misha Griffith (Oral Historian), “An Interview with Dava Sobel.,” One Book. One Author. One Hour., accessed April 24, 2019, http://booknotes.gmu.edu/items/show/2793. 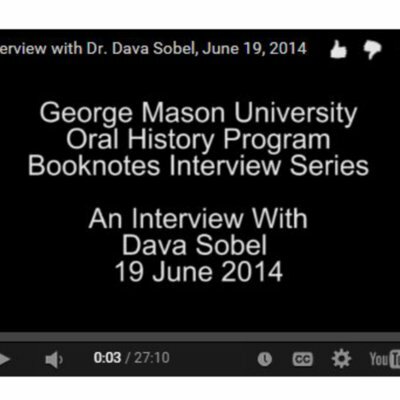 Dr. Dava Sobel is interviewed as part of the Booknotes Oral History Project on 19 June 2014. Dr. Sobel discusses her appearance on C-SPAN's Booknotes program on 17 January 1999, where she discussed her book "Longitude: The True Story of a Lone Genius." Booknotes Oral History Series. R0143 Box 01 File 11.